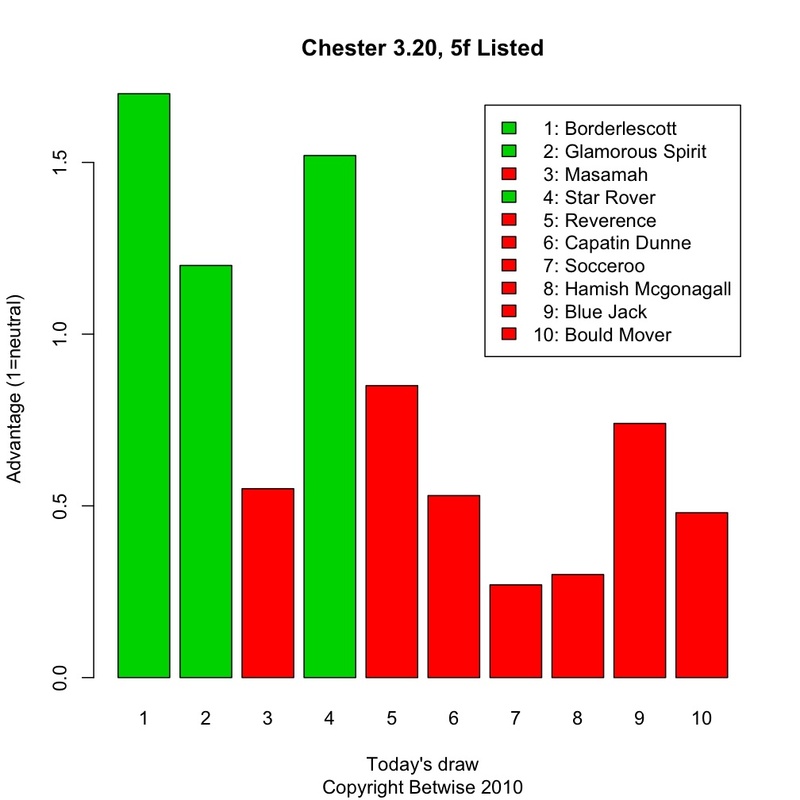 We’ve discussed the low draw advantage at Chester a number of times in this blog. Comprehensive analysis of the advantage afforded by a low draw at Chester is also one of the examples covered in the Smartform User Manual. Despite the number of times the low draw advantage is mentioned, it continues to produce a blind level stakes profit in certain circumstances (in particular sprints over the minimum distance with a decent field size on decent going). Now that the worst of the bad weather is over (and the Chester May meeting is behind us) we can hopefully look forward to decent ground and a return to the rich seam of potential winners that can be discovered by concentrating on those drawn low around the tight Chester circuit. Generally speaking, races with fewer than 10 runners declared are less compelling from a draw advantage perspective. Notice we’ve also included the distance of each race – again, races over distances beyond a mile are also less interesting (with some exceptions) from a draw perspective. Thus, the 2.55, 4.0, 4.35, 5.45 and 6 pm races are the most interesting from a draw perspective today, so that may be the richest seam to concentrate on using the first query above. Let’s hope the bias shows through again, since there are some juicy prices on offer about low drawn runners, as you can see from the forecast prices displayed above. Today’s Saturday’s front runners are now up in the Betwise Members’ area. Some interesting contenders today on the leaders front, with win chances as well as likely pace setters. Victorian Bounty is the first up in the Chester 2.20 – interesting because not only is it top of the leader rankings, meaning it is likely to set the pace, but is some way clear of its rivals on that front. And, as we’ve written many times before, he has the advantage of being drawn low, in stall 3. Stalls 1 and 2 show far and away the biggest bias, but stall 3 with a better break than that of the inner runners can be just as advantageous. Interesting that the Smartform tissue had this runner at 10/1, which is the same tissue price used on a number of online form guides, but the actual price being offered by many bookies is already a lot shorter, around 7/1. Plenty of other good opportunities in sprints today – the leader and lagger ratings are a great starting point to narrow the field before further analysis on draw and form.